Mission Statement - Field Trips Delivered! Field Trips Delivered brings education to life through unique, hands-on, three-dimensional educational programs brought directly to students. By using hands-on educational programming, students retain knowledge, learn in a tangible environment, and have an enjoyable, out-of-the-box learning experience. 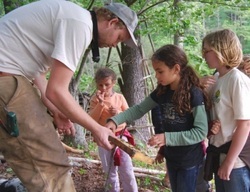 Brett Butler has been teaching at summer camps, Boy Scout events and in classrooms across NC since 1999, specializing in outdoor education, recreation and environmental education. By combining more than 18 years of experience teaching outdoors as well as a lifetime of experience in the wilderness, Brett has honed his passion of working with people in the outdoors and teaching about the wild nature that surrounds us.